Who is the Naak in Hard Naak Life? My sight is something I have never taken for granted. When I was a teenager, I had one eye with perfect vision and one that was terrible. The good eye got me through writing papers, looking at chalkboards full of notes and equations, and allowed me to only wear glasses when I was behind the wheel of my car. Over the years, my vision got progressively worse and without corrective lenses, I was like the blind guy written about in the eighth chapter of Mark who told Jesus that he could see people, but they looked like trees walking around. Fast forward to two years ago when my vision began to weaken even further. I couldn’t see anything without corrective lenses and it wasn’t much better with my glasses or contacts. In my job where I looked at computer screens, paperwork, and faces all day, seeing clearly was important. I was often plagued by headaches, had a tough time with eye contact, and struggled emotionally with this decline in sight. God is so good to send us the right people at the right time and for me that was my new optometrist. She gently told me my eyesight had deteriorated due to a cataract in my left eye. It was very rare, she said, to see one in a person my age (at that time 36) and she would send me to the eye surgeon ASAP. I cried, partly out of relief and partly out of disappointment. Even with the surgery, my sight would never be perfect. My doctor cried with me. Post-surgery, my vision is better than pre-cataract, but is still a struggle. If I have corrective lenses in both eyes, I can see distances well, but struggle to read. If I remove the corrective lens from my left eye, I can read perfectly, but cannot see far away or safely drive. My vision will never be without problems. As I sit here writing, I am trying to adjust to another new prescription in my left eye. My sweet eye doctor has made it her mission to help me adjust to my new sight, especially after another laser treatment to the cataract that grew back over my artificial lens. The one thing I know is that nothing is perfect in this life. We have sickness, sadness, and grief, all of which exist in a fallen world. I’ve learned through this journey that what is seen here in this life is not as important as what is seen through eternal eyes. 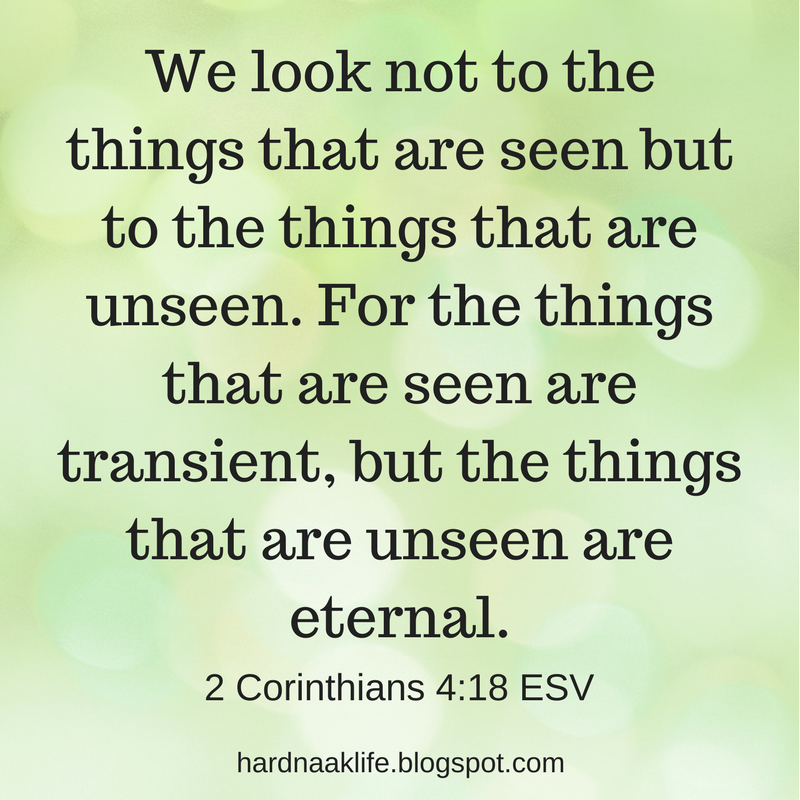 Everything I fix my eyes upon here on earth will fade, so I should give attention to what is not seen (2 Corinthians 4:18). Recently our pastor taught out of Hebrews 11:13-16 and the focus was on our future home. The writer reminds us this world is not our home because, if we are Christians, then our home is with our Heavenly Father for eternity. 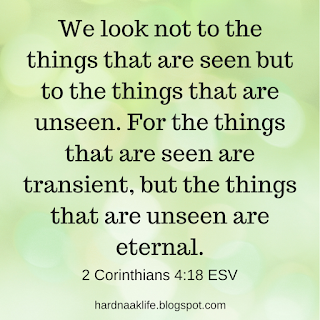 This world will pass away, so it is best to put our focus on eternal things. My sight here is faulty and sub-par, but it is just temporary. What I should be focusing on is the sight that impacts eternity. 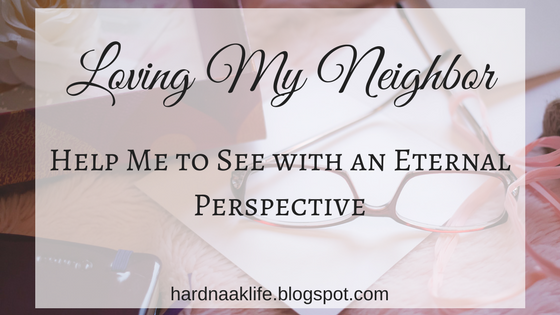 My prayer is for an eternal perspective. Help me to see the marginalized in my community and world who need someone to meet both their spiritual and physical needs. The Bible is very clear about taking care of those in need and going to the ends of the earth to share the good news of Christ’s love and sacrifice for us. The book of Isaiah is thick with encouragement to defend the oppressed, seek justice, take up the cause of the widow and orphan, and do good. God’s word compels us to see those in need and let God use us and the resources he’s given us to provide. Matthew 28:19-20 instructs us specifically to “go and make disciples” and various New Testament passages encourage evangelism. Shannon Martin, in her book Falling Free, puts these concepts together and reminds the reader that God sent His son to the earth to take the position of a humble servant. She states if He left his elevated position for a lowly one, it “should send us running breathless into every busted-up city, every barred-up shack, every cave, every cell, every pain-drenched street corner we can find in order to bring the good news¹." Help me to see those in need of a friend. Working in the public school system, I am very aware there is something lacking in our culture. Unfortunately, this doesn’t just plague our children; it is prevalent in our adults as well. The more technological we get and the busier we are, the more we build invisible walls between us. Just look around. You’ll see it in the people you encounter every day. Maybe you’ll even see it in yourself. As connected as we are with the press of a button on our computer or smart phone, it is a shallow, weak connection. It's like using dental floss to tow a broken-down vehicle. This false sense of connection can lead to loneliness and isolation, and a lack of real friendship. The truth is, we were all created for community. From the very beginning, God didn’t think it was good for man to be alone. God’s word gives us encouragement toward friendship, fellowship, relationship, and family. This starts with being more aware of the those around us and being willing to pursue those people. Help me to see those who need mercy, not judgement. Have you ever been the target of someone's judgmental attitude? It's a terrible feeling to receive judgement from another when really what you need is comfort. If I mess up, I want someone to speak the truth in love, but certainly not forget that love is part of the equation. 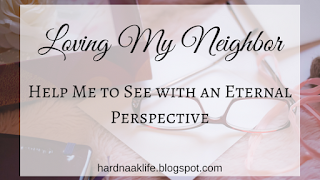 In dealing with our neighbor (friend, family, or acquaintance), it is important to always remember the plank in our own eye before passing judgment on the speck that ails our neighbor’s eye. Whenever anyone asks me for a book recommendation, I always tell them to read Interrupted by Jen Hatmaker. It is full of wisdom and many, many quotable passages, but one part I always remember tackles the topic of being judgmental. Hatmaker writes, “We are only qualified to administer mercy, not judgement, because we will pull up many a beautiful stalk of wheat, imagining him a weed².” It is not our job to stand in judgment of those around us because no one is too low or too sinful for the grace of God, including you and me. Our responsibility is to show love and mercy. Help me to see, REALLY see, the people I’m with every day. Whenever anyone famous dies, an outpouring of admiration floods the internet. I read articles listing all the ways a person was appreciated or labeled as good for the all the endearing qualities they possessed, and I wonder if their loved ones and admirers ever shared their thoughts with the person while they were living. It seems like a waste and a shame only to build someone up after death. We can speak life into our family and friends. We have the opportunity to see the good in them and make sure they know what qualities make them admirable. What’s the harm in saying kind words and pouring out encouragement? If I see my child being helpful to her sibling, I should say so. If I know one of my dear friends is a great listener, I should point out what an awesome gift this is. If I admire the confidence in one friend, or the humbleness in another, they should know I see these traits and hold them in high regard. We’re blessed to be with our family and friends so frequently it’s easy to take them for granted. My hope is to care for those around me, let them know how loved they are, encourage them, and point out all the wonderful traits and qualities that make them unique. We should spend more time building people up and see them the way God does...with eyes that see from an eternal perspective. ¹ Martin, S. (2016). Falling Free: Rescued from the Life I Always Wanted. Nashville, TN: Thomas Nelson, Inc.
² Hatmaker, J. (2014). Interrupted: When Jesus Wrecks your Comfortable Christianity. Carol Stream, IL: NavPress. Beautiful truths. Thank you for sharing your challenge and challenging me to see more clearly what's in front of me. AMEN for words of affirmation and loving extravagantly NOW !! Thank you for this moving piece. I've been having more issues lately with my weak eyes. Thank God I can see as well as I do. And I thank Him for the Word which strengthens my eternal perspective day by day. That's how we walk by faith not by sight. God bless you for sharing. My life is my husband, kids, books, coffee, and days at the local high school. Everyday, I wake up grateful to be a grace-filled Jesus follower. Life and Death are in the Power of the Tongue. Are you Speaking Life? © 2008-2017 Stephanie Naaktgeboren All Rights Reserved. Powered by Blogger.